Thank you for fast translation. GREAT! Just got updated 2.0.2.48, but I can´t get this showing on eventsview anymore. Only stupid oem Jolla weather app. Edit: Uninstalling and reinstalling this app did the trick. Installed Meecast since a long time and its working fine otherwise, but the events view doesn't show any info or icons but just the city name and meecast words. Any chance for a sailfish 2.0 version? Отличная работа! Только не понятно одно- а если удалить приложение "погода Jolla", виждет в уведомлении тоже удалиться? Как это взаимосвязано? Is it possible to make the way the widget is displayed (1 row vs. 2 rows) configurable, and keep the behaviour of opening the MeeCast app on click? I second this request, I would suggest a click on the weather on the left expands or collapses the detail view as toggle and a click on the Location name opens the front page of MeeCast while a click on the respective day in detail view directly switches to that day. To go completely overboard, maybe we can get a more narrow first row with arrows to the right and left to switch between locations on the fly? I just love what MeeCast has become, remember when there was only AccuWeather for me on the N9. IDK if MeeCast existed prior to that on the N900 maybe? Rebooting the Jolla phone did not do the job for me: Jolla's own weather app always shows an all white screen. 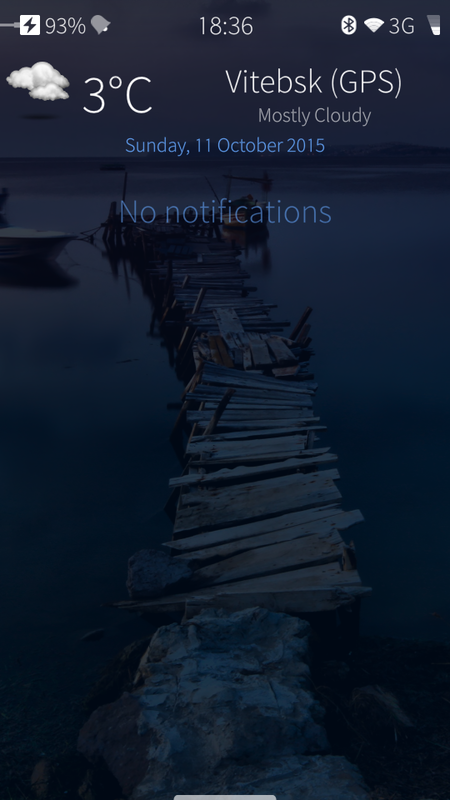 This is under SailfishOS 1.1.6.27 with Meecast, meecast-demon, meecast-lockscreen and meecast-eventview installed in their recent versions from "Warehouse". Unfortunately, uninstalling meecast-eventview and rebooting did not bring Jolla's weather app back to life. Anyway, as the flock of Meecast, meecast-demon, meecast-lockscreen and meecast-eventview is much nicer and provides more functionality compared to Jolla's weather app (and I liked OMweather on the N900 a lot), I keep all of them installed in the light of the issues TubularBell experienced, although this setup renders Jolla's own weather app completely useless for me. Kudos for the really good work, vasvlad. ... after '[nemo@Jolla ~]$ cd .config/harbour-meecast/ ; mkdir away ; mv config.xml away/', starting Jolla's weather app still shows an all white screen. But logically Meecast was completely unconfigured then, thus unusable. ... rebooting makes no difference, Jolla's weather app still always shows an all white screen. Hence I reverted that change, putting config.xml in its original place. Well, I wonder what the logic behind that advice was, i.e. why Jolla's weather app should stumble over Meecast's config file in a directory Jolla's weather app presumably never visits. Can you start meecast in terminal and send me log file from output? [nemo@Jolla ~]$ harbour-meecast > harbour-meecast_olf_2015-08-31.log 2>&1 did the job. I closed Meecast at the GUI, right after it came up. I will send you that log file. NB: I wonder why Meecast just outputs LOAD to STDout, all other messages go to STDerr. Isn't this regular information of a GUI application started from the command line? Updating to JollaOS 1.1.7.28 (from 1.1.6.27) restored Jolla's weather app (Foreca), but also Foreca's forecast is now displayed in the eventview, although meecast-eventview is still installed. I thought I could have uninstalled Jolla's own app after this, but if I do that, Eventsview starts asking do I want to instal Jolla app instead of showing Meecast.